Brucella species include economically important zoonotic pathogens that can infect a wide range of animals. There are currently six classically recognised species of Brucella although, as yet unnamed, isolates from various marine mammal species have been reported. In order to investigate genetic relationships within the group and identify potential diagnostic markers we have sequenced multiple genetic loci from a large sample of Brucella isolates representing the known diversity of the genus. Nine discrete genomic loci corresponding to 4,396 bp of sequence were examined from 160 Brucella isolates. By assigning each distinct allele at a locus an arbitrary numerical designation the population was found to represent 27 distinct sequence types (STs). Diversity at each locus ranged from 1.03–2.45% while overall genetic diversity equated to 1.5%. Most loci examined represent housekeeping gene loci and, in all but one case, the ratio of non-synonymous to synonymous change was substantially <1. Analysis of linkage equilibrium between loci indicated a strongly clonal overall population structure. Concatenated sequence data were used to construct an unrooted neighbour-joining tree representing the relationships between STs. This shows that four previously characterized classical Brucella species, B. abortus, B. melitensis, B. ovis and B. neotomae correspond to well-separated clusters. With the exception of biovar 5, B. suis isolates cluster together, although they form a more diverse group than other classical species with a number of distinct STs corresponding to the remaining four biovars. 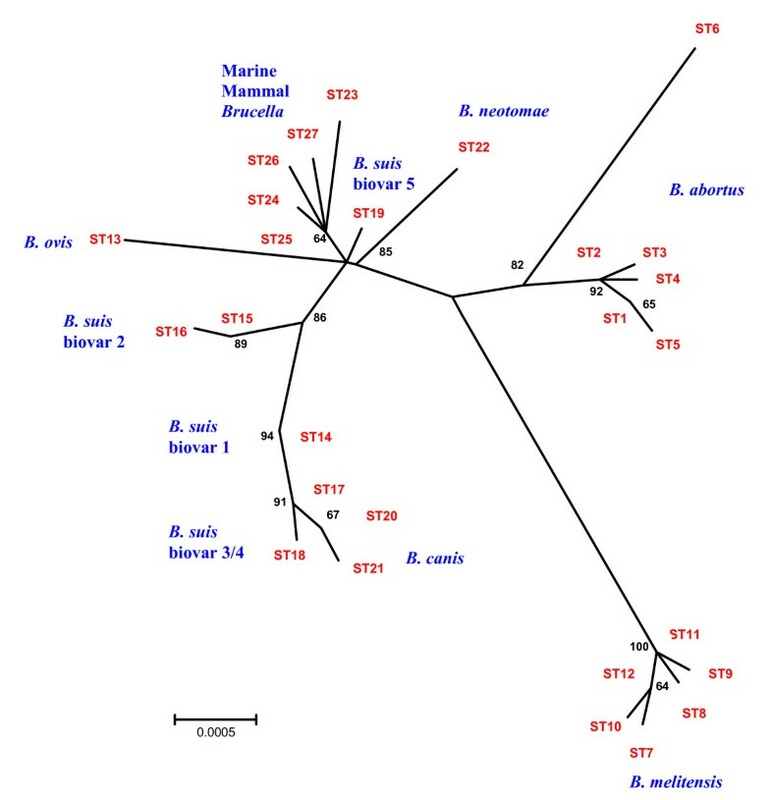 B. canis isolates are located on the same branch very closely related to, but distinguishable from, B. suis biovar 3 and 4 isolates. Marine mammal isolates represent a distinct, though rather weakly supported, cluster within which individual STs display one of three clear host preferences. The sequence database provides a powerful dataset for addressing ongoing controversies in Brucella taxonomy and a tool for unambiguously placing atypical, phenotypically discordant or newly emerging Brucella isolates. Furthermore, by using the phylogenetic backbone described here, robust and rationally selected markers for use in diagnostic assay development can be identified. Members of the genus Brucella are causative agents of brucellosis, a widespread disease of various animal species, and a common zoonotic infection of man . While some countries have eliminated or substantially reduced the disease by extensive eradication programs it remains endemic in many areas of the world . There is thus a substantial economic burden of brucellosis reflecting, either the costs of attaining and maintaining disease free status, or the cost of disease in terms of loss of productivity and control costs. Over many years Brucella taxonomists developed a classification system that recognized six classical species based on subtle phenotypic and antigenic differences and differential host specificity. Thus traditionally B. abortus (bovine), B. melitensis (caprine and ovine), B. ovis (ovine), B. canis (canine), B. suis (porcine, rangiferine, leporine) and B. neotomae (rodent) are recognised. Some of the classical species are divided into biovars although the distinction of some of these biovars is based on very slight differences and can be difficult and somewhat subjective. Multiple biovars of B. abortus, B. melitensis and B. suis are recognized currently  although the status of some biovars, particularly those of B. abortus, remains unresolved. The traditional view on Brucella taxonomy was challenged some time ago on the basis of the high level of genetic relatedness indicated by DNA hybridization experiments . This genetic conservation has since been confirmed by a variety of approaches including multilocus enzyme electrophoresis (MLEE)  and 16S rRNA sequencing . Reflecting this, comparison of single nucleotide polymorphisms (SNPs) present in three complete Brucella genome sequences (representing three distinct classical species) indicates mean diversity between genomes of around 0.22% . It was proposed that only one species, Brucella melitensis, should be recognized in the genus Brucella . However, reflecting practical considerations, this option has not found widespread support with most opting to retain the nomenspecies designations. Formal moves to reverse this decision were initiated recently . In recent years it has become clear that Brucella isolates are more widely dispersed than originally thought with the identification of isolates in various marine mammal species [9–12]. These isolates appear distinct from those previously seen in terrestrial mammals and diversity within this group of isolates has been identified by a variety of approaches [13, 14]. As a result of these findings it has been suggested that these isolates represent one or more new Brucella species [11, 15]. However, in part reflecting the ongoing debate regarding Brucella nomenclature, the new species designations have not yet been validly published and currently have no standing in bacterial taxonomy. The genetic conservation within Brucella has resulted in past difficulties in establishing the true relationships between some classical Brucella species and biovars and in identifying molecular markers for some groups. For example, B. canis has long been considered very closely related to B. suis on the basis of a number of approaches including chromosomal maps , omp profiling [17, 18], MLEE , AFLP  and insertion sequence typing  and its status as a distinct species has been questioned. Similarly, studies using AFLP and MLEE have indicated that B. suis biovar 5 is distinct from other B. suis isolates [5, 19] and thus it is not clear whether there is justification for including B. suis biovar 5 in a taxonomic group with B. suis. Indeed, the status of B. suis as a single species has been questioned in light of a broader host specificity and because, in contrast to other classical species, no species-specific markers for B. suis have been identified . The aim of this study was to determine the sequences of multiple genetic loci in order to examine the relationships between Brucella isolates representing a geographically, and temporally, diverse collection of 160 isolates belonging to all the currently recognized classical Brucella species and biovars. The availability of such an extensive and unambiguous dataset facilitates a robust assessment of relationships within and between the classical species and biovars. It will also identify polymorphisms that are of potential value as diagnostic markers and provide a preliminary validation of their distribution. Furthermore the data generated in this study will help address some of the issues raised by the ongoing debate on the taxonomy of the group and will provide a database against which to compare any new, emerging or atypical Brucella isolates. We selected 9 distinct genomic fragments for characterization in this study. Seven of the nine selected loci represent classic housekeeping genes of the type conventionally used in MLST because accumulated changes occur slowly and are believed to be selectively neutral (Table 1). The remaining loci used are a fragment of omp25, encoding a 25 kDa outer membrane protein, included as a potentially more variable surface marker that might facilitate discrimination between closely related classical species and a fragment, labelled int-hyp, that is largely intergenic though it does include the extreme 5' of a hypothetical protein. As shown in Table 1 the loci chosen are scattered around the Brucella genomes and thus change at one locus should be independent of other loci. Oligonucleotide sequences used for the amplification and sequencing of nine genetic loci. 1Location in B. abortus 9–941 genome sequence. In all 4,396 nucleotides spanning 9 loci were sequenced from 160 isolates. For each isolate the sequences obtained at each of the nine loci were compared with those of every other isolate and sequences were designated distinct alleles if they differed at one or more nucleotide sites. 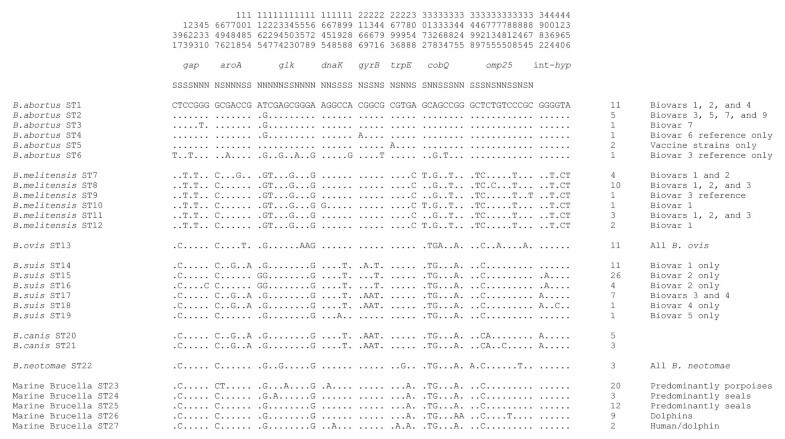 Table 2 shows the sequence characteristics compiled from all 160 strains. The number of alleles detected ranges from 5 in the case of int-hyp up to 10 in the case of glk and omp25. The number of polymorphic sites present ranges from 5 in gyrB (1.07%) and trpE (1.03%) up to 12 in omp25 (2.45%). The dN/dS ratio [dS = average frequency of synonymous substitutions per potential synonymous site; dN = average frequency of nonsynonymous substitutions per potential nonsynonymous site] was calculated to determine the degree of selection in the sequence population. As expected in evolutionarily conserved genes the dN/dS ratio is substantially <1 for all housekeeping genes except glk (1.671). The dN/dS ratio for omp25 is also substantially <1 (0.0161) while this calculation is not relevant in the case of int-hyp as much of the sequence is intergenic. The % GC content of the various loci ranges from 55.75% (int-hyp) up to 62.67% (glk) in comparison to the overall genomic GC content of approximately 57%. Analysis of the nine loci examined in the Brucella strains sampled. Each distinct allele at each locus identified by sequencing was given an arbitrary numerical designation and each unique allelic pattern over all nine loci was identified as a sequence type or ST (Table 3). Overall 27 distinct STs were identified. The positions of all polymorphisms that relate to the 27 STs are shown in Fig. 1. The relationship between STs was examined by constructing a neighbour-joining tree from the concatenated nucleotide sequences of all 9 DNA fragments that comprised each ST (Fig. 2). Examination of the unrooted phylogenetic tree shows that STs fall into clusters that largely correspond to classical taxonomic divisions. B. melitensis and B. abortus both fall into well supported clusters although ST6 (corresponding to the B. abortus biovar 3 reference strain Tulya) is divergent from the remaining B. abortus STs. There is no obvious relationship between biovar and ST in the case of B. melitensis. There is some evidence of a possible relationship between biovars and ST in B. abortus but insufficient numbers of most biovars were examined to reach firm conclusions. Isolates of B. neotomae and B. ovis, both of which were found to represent a clone by this approach (i.e. a single ST) are both well separated from other groups. The 46 marine mammal isolates examined in this study fall into 5 STs that comprise a further cluster separated from terrestrial Brucella isolates although this separation is supported by a bootstrap value of only 64%. Origins of 160 Brucella strains examined in this study showing allelic profiles and ST designations. Polymorphic sites detected at the nine loci examined in this study. All polymorphic sites are shown relative to the ST1 sequence. Polymorphic sites are shown, while dots indicate nucleotides identical to ST1. The number of strains possessing each ST is shown at the end of each sequence string while the status of each site as a potential synonymous or non-synonymous change is shown by S or N respectively. The numbers above the gene designations represent the base number in the 4,396 bp concatenated sequence. Unrooted phylogenetic reconstruction of the relationships between STs. This tree was constructed with the concatenated sequence data of the nine loci (4,396 bp) using the neighbour joining approach. The Jukes-Cantor model, which is based on the assumption that all nucleotide substitutions are equally likely, was used to determine genetic distances The percentage bootstrap confidence levels of internal branches were calculated from 1,000 resamplings of the original data. Diversity within Brucella species and identification of species-specific polymorphisms. An assessment of the linkage between alleles from the different loci was performed in order to determine whether there is evidence for extensive recombination in the Brucella population (Table 5). Standardized IA (sIA) values were determined using the LIAN software program as this statistic is independent of the number of loci analysed in contrast to the originally described IA measure . Standardized IA values are expected to be zero when a population is at linkage equilibrium (free recombination). Determination of sIA first involves computing the number of loci at which each pair of taxa differs. From the distribution of mismatch values a variance (Vo) is calculated. This is compared with the variance expected for a population at linkage equilibrium (Ve) in order to derive measures of sIA. LIAN also tests the null hypothesis of statistical independence of alleles (linkage equilibrium) at all loci by computer simulation. Input data is scrambled by resampling loci without replacement and computing a Vo value for each resampled dataset. The significance of any difference between Ve and Vo is the frequency with which a Vo value greater or equal to the original Vo value is returned from the randomisation procedure. All analyses were carried out using both all isolates in a group and reduced to the level of STs (i.e. including only one isolate from each ST) to avoid potential bias due to a possible epidemic population structure. Multilocus linkage disequilibrium analysis of the 160 Brucella isolates examined. a Veis the expected variance if the alleles present at different loci in a strain are independent (i.e. no linkage disequilibrium), Vo is the observed variance. b Standardised IA  calculated using LIAN3.1. P = probability of observing a Vo/Ve ratio equal or more extreme to that found in the original data based on 1,000 Monte Carlo randomisations. When considering all 160 isolates the sIA was significantly different from zero both when including all isolates, (sIA = 0.2286 P = 0.001), and when analysis was reduced to the level of all STs (sIA = 0.1954 P = 0.001). This is consistent with evidence of strong linkage disequilibrium between loci and a clonal population structure with little or no recombination. Equally when the sIA was determined individually for all isolates of B. abortus, B. melitensis, B. suis and the marine mammal Brucella to test for evidence of recombination within the classical species there was no statistical evidence of recombination. However, the sIA was reduced to close to zero and the null hypothesis was supported poorly when considering STs alone in the case of B. melitensis, B. suis and the marine mammal Brucella. Though these values need to be treated cautiously as the number of STs in each group is very low this might suggest that there is some recombination within some of the classical Brucella species. The overall picture of a clonal population structure was supported by split decomposition analysis performed on a matrix of pairwise distances between the allelic profiles of all STs. This showed a radial distribution of strains with a tree-like structure (data not shown). The only evidence of network like structure, indicative of recombination, was seen in the B. melitensis cluster. The data presented in this study represent a comprehensive study of genetic diversity within Brucella and the first application of multilocus sequencing to the group. Most of the data derive from housekeeping genes where genetic variation is considered largely neutral and thus such markers are considered to provide more reliable indications of genetic relatedness than genes subject to strong selection . The availability of 4,396 bp of sequence data from each of 160 strains representing nine independent loci gives an unequalled resource with which to begin to understand the extent and nature of genetic diversity within the group. Furthermore, these data will further understanding of whether the traditional taxonomic designations of the group have a sound genetic basis and serve as a platform to assist and direct future taxonomic proposals. The use of multilocus sequence data has two particular advantages. Clearly, and of particular relevance in the case of a genetically conserved group such as Brucella, the additive use of multiple loci increases the discriminatory capacity compared to that that can be obtained when using a single target. Secondly, loci can be selected that are spaced far enough apart such that any pairs of alleles are unlikely to be inherited together by recombination. This is important as recombination can distort the apparent relationships between similar isolates if they are characterized at only a single locus. Thus studies based on multilocus approaches that buffer against possible recombination are more desirable than the characterisation of individual loci. It was recently suggested that such an approach should be applied by taxonomists to large samples of groups of closely-related bacteria, and especially to those where species delineation has historically been difficult, to determine whether genotypic clusters can be delineated, and to guide the definition of species . Overall only 67/4396 nucleotide sites (1.5%) examined here are polymorphic equating to a variable site approximately every 66 bp. As expected, this is substantially more than the diversity detected based on the comparison of only three genomes  but still clearly indicates that the Brucella group is genetically rather uniform. This is in agreement with the recent observation based on genome sequences of a highly conserved genomic backbone within which species-specific DNA sequences and pseudogene distribution might correlate with different host preferences . Within individual housekeeping gene loci diversity ranges from as little as 1.03% in trpE up to 2.32% in glk a level only marginally less than that seen in the outer membrane protein encoding fragment omp25 (2.45%). Nucleotide substitutions in genes coding for proteins can be either synonymous (do not change amino acid) or non-synonymous (change amino acid). Usually, most non-synonymous changes are expected to be eliminated by purifying selection, but under certain conditions Darwinian selection may lead to their retention. Therefore investigating the number of synonymous and non-synonymous substitutions provides information about the degree of selection operating on a system. As housekeeping genes are considered to undergo change that is selectively neutral or be subject to purifying selection the rate of synonymous change (dS) should be equal or greater than that of non-synonymous change (dN) giving a dN/dS ratio of <1. For 6 of the 7 housekeeping genes fragments examined in this study this is the case. However the ratio for glk is 1.671 suggesting that this gene fragment may be subject to positive Darwinian selection. Interestingly this fragment is by far the most variable of the housekeeping fragments and also has a GC content of 62.67% representing the fragment furthest removing from the genome average of 57%. The reasons for the evidence for selection operating on glk are unclear – it is possible that this gene may somehow influence pathogenic potential, transmissibility or tissue tropism. Alternatively this finding may reflect a hitchhiking effect where change at a locus subject to selection can drive change in neighbouring genes that are not themselves subject to selection . The omp25 fragment encodes a surface marker potentially subject to selection. However, although it is the most variable fragment examined, most change in this gene appears synonymous and the dN/dS ratio is among the lowest apparent in this study. The availability of multilocus sequence data enables an assessment of the extent of genetic recombination to be made by examining linkage equilibrium in a population. This not only gives an indication of the process of evolution in the group but also allows an assessment of whether meaningful phylogenetic interpretations can be made from multilocus sequence data. Analysis of linkage equilibrium in the complete population examined here was consistent with a clonal population structure with little or no recombination. This finding gives confidence in the utility of SNPs identified in this study as stable markers of particular phylogenetic groups. There is weak evidence that there may be some recombination within traditionally recognized species, notably B. melitensis, based on linkage equilibrium analysis and split decomposition analysis, but confirmation of this requires a much more extensive intraspecies study. These observations are consistent with the classical Brucella species evolving as isolated units in their preferred host species  where recombination may be theoretically possible but is restricted by ecological isolation. The traditional taxonomic designations of Brucella are in large part based on the apparent host specificity of the nomenspecies. As moves are ongoing to reverse the decision to define Brucella as a single species  and to formalize the taxonomic position of marine mammal Brucella the data described here will allow informed decisions to be to made that reflect genetic relationships as well as phenotypic properties and host associations. The definition of bacterial species is a subject of constant debate . The gold standard approach is a 70% DNA-DNA hybridization cut-off though this method is infrequently used today. Most designations are based on 16S rRNA sequences though these are highly conserved with insufficient resolution to explore closely related populations . Although the figure of <97% identity in 16S rRNA sequences is often quoted as a cut-off between species pragmatic definitions have led to situation where the extant genetic diversity in different species differs greatly . Clearly, on the basis of both DNA-DNA hybridization and the 97% 16S rRNA sequence diversity cut-off, all Brucella could validly be considered members of a single species. However, equally the dendrogram constructed on the basis of concatenated sequence data (Fig. 2) does clearly separate most of the classically identified species on a genetic basis, albeit with low levels of diversity between clusters. Thus, there is clear separation of B. abortus, B. melitensis, B. ovis, and B. neotomae into well defined clusters or clones and therefore their identification as separate classical species does appear valid on both grounds of genetic separation and host specificity. The one possible exception here is the B. abortus biovar 3 reference strain Tulya (ST6) that branches off very early on the branch to all other B. abortus isolates. This isolate has previously been shown to be atypical relative to other B. abortus by VNTR analysis . Interestingly, two distinct groups of B. abortus biovar 3 isolates were recently described , one of which corresponds to Tulya, while the other corresponds to local field isolates from Spain. The situation with B. suis and B. canis is more complex. 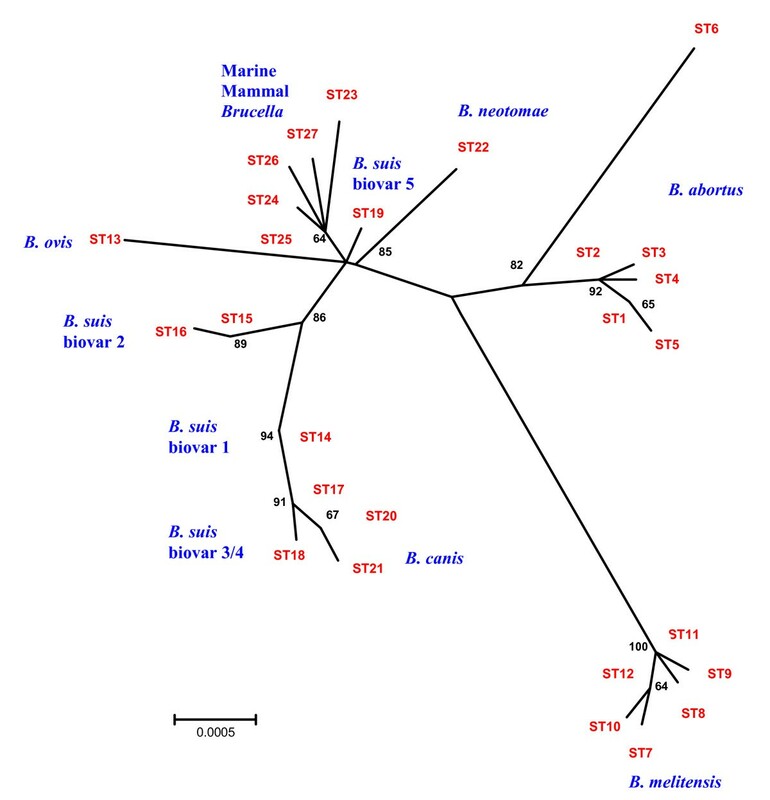 B. suis has long been considered to be a more diverse group of organisms than other classical Brucella species and this is confirmed by the branch lengths within the B. suis cluster seen here (Fig. 2). The status of B. suis biovar 5 as a bona fide B. suis isolate has been questioned. In support of this the reference strain does not cluster with other B. suis isolates on the basis of sequence data described here and appears more closely related to the marine mammal Brucella. The B. suis biovar 5 ST (ST19) has only two polymorphisms relative to the closest marine mammal ST (ST25) while there are five polymorphisms relative to the closest B. suis ST (ST15 – biovar 2). Isolates of the remaining four B. suis biovars do fall into a single branch. In contrast to B. melitensis there is clear separation of the distinct B. suis biovars (with the exception of biovars 3 and 4 that could not be separated by this approach). Thus, the phylogenetic tree generated here does support the classification of B. suis biovars 1–4 in a single species. There have been arguments for subdividing this group on the basis of distinct host specificities. This might be problematic from two aspects. Firstly the overlapping host specificities of B. suis biovars 1, 2, and 3, associated with pigs, makes separation on this basis difficult. Secondly, although there would be grounds on the basis of host specificity for separating B. suis biovar 4 which appears confined to rangifers, this biovar is genetically very closely related to B. suis biovar 1 being separated by only 2–3 polymorphisms. However, and conversely, if the same criteria were applied to B. suis biovar 4 as to B. canis, an argument could be made in favour of its classification as a separate species. B. canis has long been known to be closely related to B. suis  although its host specificity appears virtually absolute. This study confirms the close relationship of B. canis with B. suis biovar 3 and 4 isolates from which it differs at only 1 or 2 polymorphic sites both located in the omp25 fragment. This study also allows us to address the ongoing debate surrounding the taxonomy of the recently discovered marine mammal Brucella. Following early observations that marine mammal strains varied both phenotypically and molecularly from other Brucella and within the 'group' [11, 13, 15, 35–38] a number of controversial names that failed to follow the monospecific classification system were proposed. Initially a single marine mammal species, B. maris, was proposed . Later, division into two species representing isolates originating from porpoises, dolphins and minke whales (B. cetaceae) and seals (B. pinnipediae) was proposed based on polymorphism at omp2 . It was later acknowledged that a narrower host range may exist than that suggested by the omp2 locus . In support of this genome profiling led to a suggestion that three distinct groups of marine mammal Brucella characteristic of dolphins, porpoises and seals should be recognized . Our study confirms that the marine mammal Brucella do form a cluster distinct from all other species (Fig. 2) on the basis of the sequence data presented here. However, bootstrap support for this group is rather low and more data are required to confirm this clustering. While somewhat more diverse than B. abortus (excluding ST6) and B. melitensis, the marine mammal group has a similar level of 'intragroup' diversity as B. suis biovars 1–4. On this basis classification within a single species might be justified. However, this study also strongly supports the division into three groups with clearly distinct, though not absolute, host specificities (Table 3). Thus, in the extensive collection of marine mammal isolates sampled here, ST23 is strongly associated with porpoises (75% of isolates), ST26 is associated only with dolphins, and ST25, and its single locus variant ST24, are strongly associated with seals (80% of isolates). Although the sequence distances between these groups are small (e.g. ST 25 and ST26 differ by only two polymorphisms) if the criteria applied for B. canis speciation were applied here (i.e. speciation on the basis of distinct host specificity rather than substantial genetic separation) these groups could justifiably be classified as three distinct species. In this scenario the status of the remaining marine mammal ST, ST27, would remain unresolved. Although it appears genetically most closely related to ST25 the natural host of this ST is unclear. We found ST27 only twice, once in a bottlenose dolphin isolate , and once in a human infection where the source was not obvious . The number of intraspecies polymorphisms detected and the presence of species-specific polymorphisms is shown in Table 4. Both B. neotomae and B. ovis represent a single clone in this study. The B. neotomae situation may simply reflect the paucity of available isolates representing this classical species but the B. ovis population used was more extensive and obtained globally. The lack of diversity in B. ovis relative to other classical Brucella species reflects recent findings by PFGE  and VNTR analysis . As already discussed, if one excludes B. abortus Tulya, B. suis is the most diverse of the remaining classical species with biovars corresponding to STs. In contrast only a single polymorphism was detected within B. canis isolates. The remaining groups comprising B. abortus, B. melitensis and the marine mammal Brucella have between 4 and 8 'intraspecies' polymorphisms. There was no clear relationship between biovar and ST within B. melitensis. This finding is in agreement with observations based on multiple VNTR typing approaches where there appears not to be a strong correlation between genotype and biovar [24, 25]. This suggests either that B. melitensis biovars do not correspond to true genetic groups, or that biotyping is so subjective that isolates are often incorrectly assigned masking any genetic relationship. B. melitensis biovars are notoriously difficult to distinguish as they are technically only serovars and thus their identification is particularly dependent on well trained staff and well-controlled preparation of monospecific sera. In contrast there is evidence that some B. abortus STs correspond to particular biovars but a much more extensive intraspecies study will be undertaken to fully assess this. Species-specific markers in Brucella have sometimes been difficult to identify and for many years this hampered the development of molecular diagnostics. Recently Moreno et al. noted that while the presence of various markers uncovered in recent years support the validity of host range as a criterion for defining Brucella species no species specific marker for B. suis in omp genes or elsewhere had been reported. As reported in Table 4 this study identified at least one apparently species specific SNP in all classical species except for B. suis. Thus, with further validation above and beyond the 160 strains examined in this study to confirm species-specificity, these SNPs represent potentially valuable diagnostic markers. While no species specific SNPs for B. suis were uncovered this in part reflects the fact that the classical species groupings are not entirely consistent with genetic groups. There are two SNPs that are specific to the major B. suis/B.canis genetic group (dnaK-1928; gyrB-2471). These SNPs are not present in B. suis biovar 5 reflecting the fact that this ST does not lie within the B. suis/B canis genetic group. In addition these SNPs are shared with B. canis, reflecting the position of B. canis as a terminal branch in the B. suis group. However, B. canis can be differentiated from B. suis by the presence of its own species specific SNP (Table 4). The data presented here have broad implications both in understanding the genetic diversity of the Brucella group and generating a robust taxonomic description, and in the development of potentially useful diagnostic tools. The scheme provides the basis for more extensive sampling of the Brucella group so that population diversity can be more fully estimated and isolates assigned to existing or new lineages. Clearly there are inconsistencies in the current taxonomy. We believe the data presented here will help generate discussion in this area and assist in resolving these issues. A strong argument could undoubtedly be made for reclassifying B. canis as an additional B. suis biovar, particularly given that the existing biovars already have distinct host specificities. B. suis biovar 5 could justifiably be removed from this group. The marine mammal isolates could be classified as a single species, but divided into subtypes corresponding to the host-specific STs described here or alternatively be classified as three distinct species on grounds of both (limited) genetic separation and apparent distinct host specificity. The existing classical species designations for B. abortus, B. neotomae, B. ovis, and B. melitensis appear genetically valid although the status of strain Tulya as an appropriate B. abortus biovar 3 reference strain needs investigation. Clearly sequencing of the nine fragments described here is a potentially valuable tool for the identification of unknown Brucella isolates to classical species and/or biovar level the value of which can only increase as we add additional data to the extensive database already in place. Ongoing work is extending this database by both sequencing more targets to identify additional markers (particularly at the biovar level) and sequencing additional strains (particularly B. abortus and B. melitensis) in order to clarify, in conjunction with ongoing VNTR based studies , the relationships between genotype and biovar. Furthermore, the database provides a framework for placing any new or emerging Brucella groups in relation to current knowledge. Finally, while sequencing the nine loci offers an excellent way of categorising Brucella isolates it is somewhat tedious and is not always a practical option. This study has identified a large number of well-defined species-specific markers, potentially useful for the development of diagnostic assays, that would avoid the need for such sequencing. The SNPs identified here have a number of advantages for use in such assays. As Brucella represents such a conserved group, and as most of the targets described here are housekeeping genes, SNPs are likely to have occurred only once in evolution. Equally, they are unlikely to mutate to new states or back to their ancestral state. Therefore, the phylogenetic framework presented here facilitates the confident selection of SNPs that define particular classical species, biovars or other groups. Assays based on these SNPs, that could offer a practical, robust and unambiguous alternative to biotyping, are under development in our laboratory and will be described elsewhere. A total of 160 isolates of Brucella were examined in this study. These represented all currently recognized classical species and biovars of Brucella (including all type strains and biovar reference strains) as well as an extensive collection of marine mammal isolates. The remaining sample was made up of field isolates from diverse hosts and geographic sources. Isolates were biotyped following standard procedure  although in some cases biovar designations reflect those provided by original strain suppliers. Templates for the PCR were prepared as described previously . Nine distinct genome fragments were amplified by PCR using the primers shown in Table 1. PCR reaction mixes were prepared for each sample by mixing 5 μl FastStart 10× PCR Buffer with MgCl2 (Roche), 5 μl 2 mM dNTPs, 0.2 μl of each primer (at 100 pmol/μl), 0.25 μl of FastStart Taq DNA polymerase (Roche) and 39 μl of water. Routinely 0.5 μl of methanol extract or diluted genomic DNA was used as template. Cycling parameters were as follows: 94°C for 5 min. followed by 30 cycles of 94°C for 1 min., 53°C for 1 min. and 72°C for 1 min. and a polishing step of 72°C for 10 min. Products were separated by agarose gel electrophoresis to check for efficiency of amplification and to ensure that only a single product of the expected size (1) was present. PCR products were then purified by passage through QiaQuick PCR purification columns (Qiagen) and sequenced from either end using the same forward and reverse primers as used in initial PCR amplification. The Big Dye terminator cycle sequencing kit version 3.1 (Applied Biosystems) was used according to manufacturers instructions. Sequence data was edited using the Lasergene package – manual editing was performed in the Editseq module while the SeqMan module was used to generate contigs from the forward and reverse sequences. Each distinct allele at each of the nine loci examined was given a distinct arbitrary numerical designation and each unique allelic pattern over all nine loci was identified as a sequence type (ST). Allelic profiles and sequence data were imported into the START package  to determine mean % GC content. The same package was used to calculate the average frequencies of synonymous substitutions per potential synonymous site (dS) and nonsynonymous substitutions per potential nonsynonymous site (dN) by the method of Nei and Gojobori  in order to test the degree of selection on a locus. The standardized IA (sIA), a measure that scales according to the number of loci analysed was calculated in the LIAN3.1 program [45, 46]. LIAN3.1 was also used to test the null hypothesis of linkage equilibrium. A representative strain of each genotype (ST) was used for phylogenetic analysis. Sequences of the nine loci were concatenated to produce a 4,396 bp sequence for each genotype. Phylogenetic analysis was performed with the MEGA software, Version 3.1 . Neighbour joining trees were constructed using the Jukes-Cantor model and the percentage bootstrap confidence levels of internal branches were calculated from 1000 resamplings of the original data. Split decomposition analysis  of allelic profile data was performed using a web-based version of the SplitsTree program . All sequences described in this study have been deposited in the EMBL database [EMBL: AM694191 through EMBL: AM695630]. Work described in this manuscript was funded by the UK Department for the Environment, Food and Rural Affairs (Defra) and the VLA Seedcorn Program (Grant SC0139). We thank Sally Cutler who helped facilitate this study and Julie Scott, Stephen Shankster, Terry Murphy and Mike Stubberfield, all of whom made occasional contributions to some of the PCR and sequencing work. We gratefully acknowledge the many colleagues, past and present, who have submitted isolates to VLA Weybridge over many years allowing us to build up a culture collection to support this study. AMW conceived of and designed the study, carried out most of the experimental work, analyzed the data and drafted the manuscript. LLP carried out biotyping, oversaw strain provision and provided expertise on conventional Brucella identification and typing. APM provided intellectual input and expertise in relation to Brucella taxonomy.